RCHS is excited to offer new programming for adults and families! Have you ever longed to uncover some of our community’s hidden history? Wondered how historians and authors research and write the stories of the forgotten past? Discover the stories of the people and places that shaped our community! Ramsey County Historical Society is excited to offer presentations and talks by some of our community’s best local history authors, researchers and archaeologists, History Revealed. We offer audiences of all ages a glimpse into the lives and hidden history of some of the people and places that forged our community in a series of free presentations and book talks, with a new series at the Ramsey County Roseville Library. The series will feature a wide range of topics drawn from the heritage and traditions of Ramsey County, with exciting presentations, walking tours, book signings and more. And in all these stories, you’ll learn about the passions, trials and tribulations of researchers, and what it took to uncover and reveal these hidden gems of history. 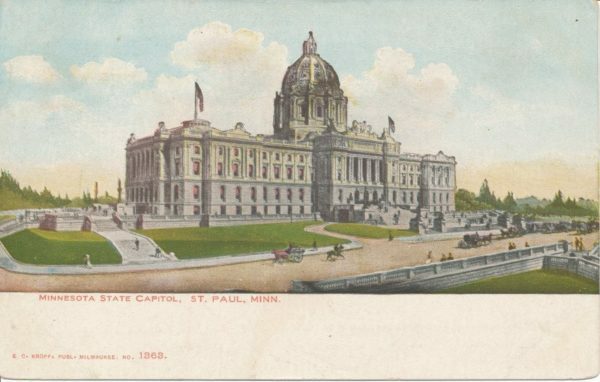 Photo: Postcard of the Minnesota State Capitol, circa 1901. Published by E. C. Kropp, Milwaukee. From the RCHS Collection. For a link to many of the articles published in Ramsey County History magazine by our program presenters, see the Presenter Articles page. Click on the links below each listing for more information. Please watch for event details and date confirmations. Other programs may be added.